As electromechanical systems require more functionality while overall dimensions remain relatively similar, thermal management and design continue to play a critical role in the design and production of these systems. These are well-known drivers for thermal management in the computing, power conversion, telecommunications and networking industries; however, thermal management is also a critical element in the design process for medical, industrial, automobile, solar and LED lighting applications. Designing and selecting appropriate heat sinks, fans, cooling vents, etc. Sanmina also provides complete thermal management and design services to support mechanical and electrical design of complex electromechanical systems. 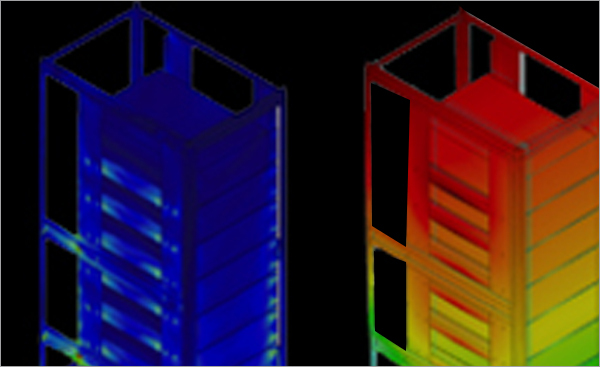 These thermal design services include full analysis and simulation, using industry standard tools such as Ansys Icepak. Thermal analysis may be done on component, board, system and rack/data center levels. Sanmina has designed and built water-cooled, in-row coolers for data center applications. These products are known as ECOBAY2 and can be mounted in hot-isle/cold-isle containment PODs to cool equipment racks. A containment POD has been installed in Sanmina’s Mechanical Systems Division (MSD) thermal lab cooling up to four equipment racks demonstrating the cooling capacity of the ECOBAY2 coolers.